The Sign of Victory Returns! When Bandai Namco released Tales of Vesperia as an Xbox 360 exclusive, there was a big portion of RPG fans that missed out on the game. Bandai Namco teased fans with a PlayStation 3 release, but that extended version never left Japan. For years fans of the Tales series had been clamoring for Bandai Namco to bring the game to a modern console, and with the release of Tales of Vesperia: Definitive Edition, the fans got what they wanted. Spanning multiple new platforms, Bandai Namco provided an opportunity for those that missed it initially to finally give the game a chance. The remaster stays true to the PlayStation 3 version, adding new characters, cutscenes, artes, and mini-games, as well as upscaling the graphics. The cel-shading design really pops as Vesperia remains a beautiful game to play through. The characters and the world they live in look great despite being from a ten-year-old game. Tales of Vesperia is also one of the last games in the series to have a traditional overworld. The world of Terca Lumireis is large and has interesting and vivid locations to explore as the story progresses. 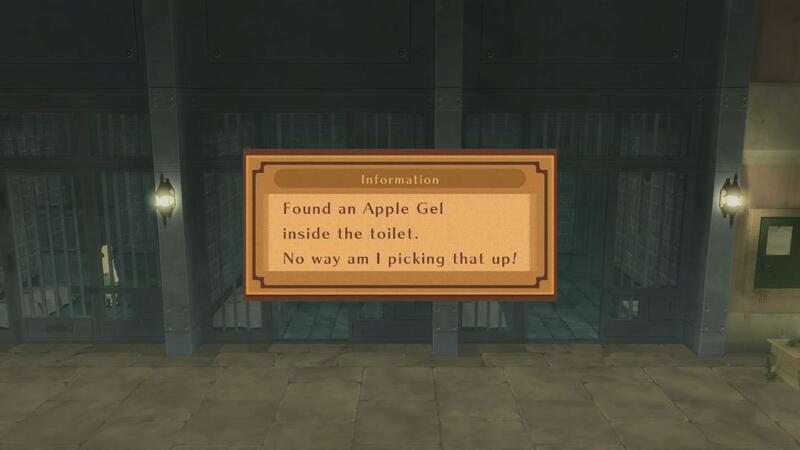 The story in Tales of Vesperia accomplishes what it needs to do, but doesn’t really break new ground in the RPG genre. The inhabitants of Terca Lumireis have become dependent on a form of power known as blastia to maintain their daily routines. Blastia and how overly reliant the people have become to this source of energy becomes one of the central focal points of the story. The story is easy to follow, never gets overly complicated, and adds breaks for exploration as the party gathers better means of travel. Unfortunately, the ending leaves little resolution as the last boss does not constitute as a noteworthy finale. Still, the strong cast help push the story along, and it hardly drags progression down too much, making Tales of Vesperia a pleasant experience throughout the journey. There are many hidden secrets…in questionable locations! Vesperia’s protagonist is unlike any other seen in the series. Yuri Lowell is a cool, confident, usually rebellious individual. He was part of the imperial knights of Zaphias, but left shortly after joining because he did not agree with how the Empire looked down on the less fortunate citizens. Often one to break a law or two to serve the greater good, Yuri is constantly at odds with his longtime friend, Flynn Scifo. Though a major NPC in the original Vesperia, in the Definitive Edition Flynn becomes a fully playable character near the end of the game. Alongside Yuri are plenty of other distinct characters including his faithful canine companion Repede, the sheltered maiden Estellise, the traditional younger characters in the form or Karol and other new Definitive Edition party member Patty, and others. The nine playable party members mesh well with one another, with the relationship between Yuri and Karol being one of the better interactions the game has to offer. Karol often needs a boost to his confidence, and while Yuri might seem to tease Karol, he successfully comes off as a big brother to Karol helping build the young man’s convictions. Yuri also has a strong but complicated relationship with Flynn. The two are rivals, with both sides having solid reasons for their actions, just with different viewpoints. Flynn is straight-edge knight who sometimes blindly follows orders, while Yuri goes rogue and dispenses his own form of justice outside the constraints of the law. 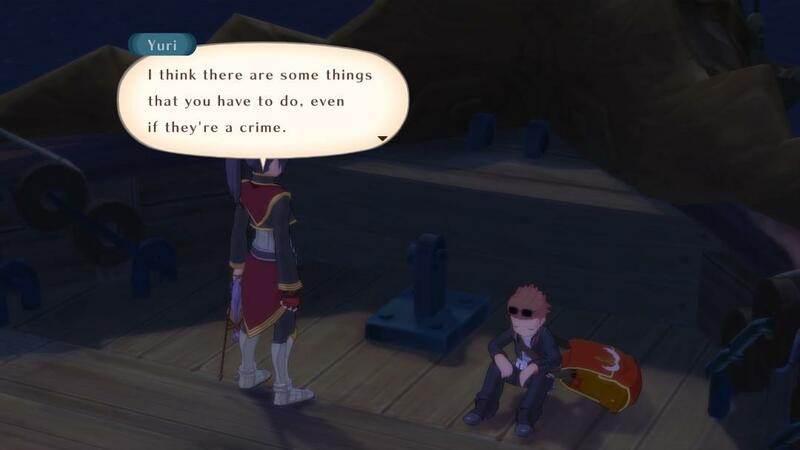 While most of the cast experience some character development throughout the game, Yuri doesn’t really grow much as a character from start to finish of Tales of Vesperia, and that’s okay. Instead, Yuri acts as role model to most of the other cast members, often guiding them through tough times. Patty is the wild card of the team, as she was not in the original version at all. It’s easy to notice how she is shoehorned into the major scenes. Without her, the story loses nothing significant. A great way to flesh out characters returns in the form of skits, one of the better staples the series has. During the team’s travels, a skit button will pop up that adds a break for party banter. While they are good at adding to the plot, help build character development, or interject humor between tense situations, the overabundance of skits can become tiresome with how many the game throws out, especially given a good amount are not story related. Thankfully, skits can be skipped if one is willing to forgo a little extra exposition. Battles in Tales of Vesperia are fluid and crisp. The Linear Motion Battle System returns in the Definitive Edition, remaining unchanged from its initial release. 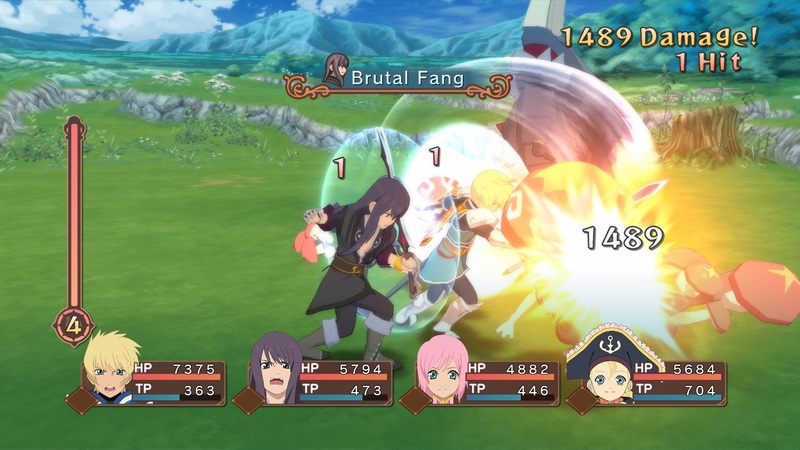 Tales games are known for their action-packed combat, and Vesperia does not disappoint. It may not be as fast-paced as some of the newer titles, but combat is quick and there are tons of abilities to throw at enemies. Combat flows seamlessly and each character has a unique skill set, which makes most characters fun to play as. Yuri fights with swords and axes, and his attacks rely on swift strikes with punches thrown in. Flynn is a more traditional swordsman, who shares some of Yuri’s moves, but is less wild with his approach. His fighting style is reminiscent of the older Tales protagonists. Combat consists of stringing combos together to keep the enemy held in a stun-lock state. The ability to parry, sidestep, and block attacks becomes more important in higher difficulty settings. Equipment also plays an important role and adds an extra layer of depth as certain items offer permanent skills to be equipped for each character. With monsters roaming around fields or dungeons, players can engage or attempt to avoid them as they see fit. Once battles have begun, players control one of four party members, and the large arena field for combat provides plenty of room to attack enemies, run away, cast spells, or use an item defensively. With an adjustable difficulty, the player can control how hard combat can be. On easy, there is little effort needed to blitz through the entire game. Upping the difficulty will add tons of extra hit points to all mobs fought, and also increase the grind. Harder difficulties do offer additional GRADE points, though those are only useful for New Game Plus mode as they can only be used after completing the game. The normal difficulty is consistent other than a few early bosses that seem overpowered compared to the rest of the game. The Secret Missions act as an extra challenge for certain boss battles. These consist of successfully performing a predetermined action against the boss. There are twenty-five in total with a large “Great” message flashing on the screen upon successfully accomplishing one. A guide is recommended since the game does not openly explain the requirements, though the remake includes an area where players can replay the boss battles with secret missions. New music has been added to the Definitive Edition, though nothing stands out as being too memorable, and the score primarily penned by Motoi Sakuraba has the same style found in most of the rest of the series. Every time the game is booted up, the option to choose between English and Japanese voice acting is presented to the player, though the English voice cast for Vesperia is one of the stronger teams assembled in the series. The cast brings each character to life, and there is good chemistry between the group. However, there is one issue with the English voice acting. For whatever reason, Troy Baker was not brought back to voice Yuri’s additional scenes. While Troy’s replacement, Grant George does a decent job on its own, there are very noticeable shifts in Yuri’s voice from one scene to another. While not always a glaring issue, it sometimes takes away from the scene hearing the difference in Yuri’s dialect. Yuri Lowell is not your stereotypical Tales protagonist. Completionists will find some annoyances. For one, the game asks players to follow stringent requirements to unlock or progress quests or they become lost forever. This may lead to players missing out on extra artes, items, and quests that unlock costumes and titles for characters. The remake helps, but only with a certain few scenarios, like preventing the optional the ex-dungeon from becoming unobtainable. There are some pacing issues in the game, as travelling to old locations becomes a bad trend in Vesperia. Sometimes the game will give vague hints where to go next, using continent names as indicators. In a few situations Yuri breaks away from the team and players need to talk to each character individually for more exposition. There is an excessive number of alerts pointing out when party members temporary leave the party, often for very short amounts of time. Finally, there is no auto-advance option for event scenes. It would have been nice to let conversations play out automatically, but the need to press a button remains, one of the elements that points out the game’s age. All downloadable content that was previously available comes packed into the Definitive Edition for free. This includes leveling packs, high level synthesizing items, money, and additional costumes. The leveling pack alone can break the game wide open as it will grant the entire team with forty free levels which can take an early party straight to end game levels. The synth packs also include some pretty powerful items, so if a player does not want to deal with the grind and just enjoy the story, this is the way to go. Replaying Tales of Vesperia in the form of the Definitive Version felt great, being held back by a few minor dating issues. The cast is colorful and fun, battles are fun, and the story will keep players engaged as long as they don’t mind the occasional back-tracking. For those that missed or skipped the game back when it released on the Xbox 360, the Definitive Edition offers an easy way to remedy that omission. It seems as though Bandai Namco released this game as a stopgap as they prepare for a brand new entry to the series. Tales of Vesperia is often regarded as one of the better games in the series and is now more accessible than ever. The game still looks good after all these years. Yuri remains one of the best characters in the series. Skits are fun way to flesh out the characters. The changing of voice actors can be jarring at times. There are some pacing issues.